The Alliance of Confessing Evangelicals and WFIL 560 AM have had a long partnership. In addition to broadcasting The Bible Study Hour with James Boice and No Falling Word with Liam Goligher, they are one of the sponsors of this year’s Philadelphia Conference on Reformed Theology taking place in Bryn Mawr April 28-30. 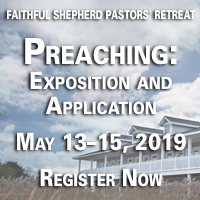 Advance registration ends on April 23, we encourage you to attend. WFIL’s most recent issue of their magazine FaithTalk features articles on the Reformation including “Luther, and the Creative Power of the Word” by Carl Trueman. Carl, co-host on Mortification of Spin, will be joining us as a conference speaker at PCRT. His article is shared here with permission. Yet there is more to Luther. Indeed, perhaps his greatest contribution to the faith, and one that we can still learn from today, is his understanding of God’s Word. When we hear this term, our modern evangelical minds typically go to the contemporary debates about inerrancy, infallibility, interpretation and the like. Certainly such questions are legitimate. But for Luther the central point about the Word of God was its creative power. God’s speech is the means by which he does things – makes, destroys, blesses, curses. The idea of the Word as creative is particularly evident in Luther’s Lectures on Genesis. In reflecting upon Genesis 1, Luther is constantly mesmerized by the fact that God’s Word is what brings creation into being, what makes one type of creature out of material which cannot naturally do such – as in birds emerging from the waters on the fifth day. God says and it comes to be. The Word is a powerful, creative force. This, of course, underlies his most famous of doctrines: justification by grace through faith. Unlike medieval notions of justification, where God’s declaration that the believer is righteous is rooted in some quality intrinsic in the believer, Luther famously makes this a matter of extrinsic declaration. Sinners are righteous because God has externally declared them to be so, no matter what their actual, real outward condition might appear to indicate. I may be a thief and a liar but, if I turn and put my trust in Christ, I am clothed in his righteousness and God’s Word will declare me innocent. And this ties in with his understanding of the love of God. As he said in the last theological thesis of the Heidelberg Disputation in 1518, the love of God does not find but creates that which is lovely to it. How does it do so? By the Word. I would suggest that this is one aspect of Luther’s theology which both pastors and congregations can benefit from meditating upon. For the pastor who preaches, the idea that when he declares God’s Word he is not simply describing a state of affairs but is actually confronting people with God’s Word in a manner that can and must transform them should surely be an awe-inspiring, exciting, and humbling thing. In the pulpit, Luther did not think he was simply explaining the Bible. He was blessing those who turned to Christ and cursing those who turned away from him, carrying some to heaven and shutting the gates of paradise to those who simply hardened their hearts. And congregants should go to church with a sense of expectation. They go to church not simply to learn the Bible better – they can do that by sitting at home and reading good commentaries. No, they go to hear God’s Word in all of its powerful, untamable creativity. The Word of God preached for blessing and for cursing – that is the heart of Luther’s practical and theological Reformation. Carl Trueman is a co-host on the Mortification of Spin podcast, professor of Church History at Westminster Theological Seminary, and pastor of Cornerstone Presbyterian Church. He has an M.A. in Classics from the University of Cambridge and a Ph.D. in Church History from the University of Aberdeen and has taught on the faculties of theology at both the University of Nottingham and the University of Aberdeen. He has authored a number of books, including The Creedal Imperative and Luther on the Christian Life: Cross and Freedom.